Read Gatewaytoyota.ca news digest here: view the latest Gateway Toyota articles and content updates right away or get to their most visited pages. 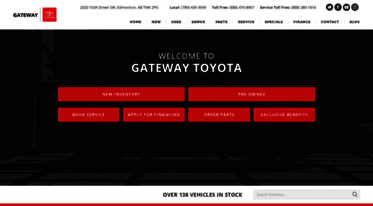 Gatewaytoyota.ca is currently listed among low-traffic websites, with around 9.8K visitors from all over the world monthly. It seems that Gateway Toyota content is notably popular in Canada, as 91.5% of all users (8.9K visits per month) come from this country. We haven’t detected security issues or inappropriate content on Gatewaytoyota.ca and thus you can safely use it. Gatewaytoyota.ca is hosted with Amazon.com, Inc. (United States) and its basic language is English. Gateway Toyota offers performance and off-road parts for your truck. Available to residents from Edmonton, Sherwood Park, Leduc, St. Albert, and Beaumont. Receive quality service and maintenance on Toyota RAV4, Corolla, Camry, Tundra, and other great Toyota vehicles. Registrant: Gateway Motors (Edmonton) Ltd.